Decoration 2 large full-page miniatures, followed by large or small decorated initials with partial foliate borders, in colours and gold (ff. 60v, 138v). 2 large historiated initials with three-sided foliate borders, in colours and gold (ff. 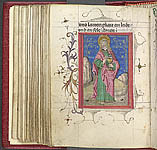 16, 41v). 11 large decorated foliate initials with full foliate borders, in colours and gold (ff. 159, 162v, 177, 196, 212, 225, 233, 244, 254, 263, 268). 8 large or small decorated initials with partial foliate borders, in colours and gold (ff. 27, 38, 77, 78, 85, 108, 142, 151v). Small initials (2 lines) in gold with brown pen-flourishing or in blue with red pen-flourishing. Small initials (1 line) in plain gold or blue. Capital letters highlighted in red. Binding BM/BL in-house. Rebound in 1969. Provenance Inscribed prayers in German and Latin, late 15th century (ff. 156-158, 161, 194v-195, 266-267). Notes Fragment of a 14th-century text leaf of a Bible, Apc. 5., used as a flyleaf. Select bibliography A Catalogue of the Harleian Manuscripts in the British Museum, 4 vols (London: [n. pub. ], 1808-12), II, no. 2841. Walter de Gray Birch and Henry Jenner, Early Drawings and Illuminations: An Introduction to the Study of Illustrated Manuscripts (London: Bagster and Sons, 1879), p. 14. Deutsche Handschriften in England, ed. by Robert Priebsch, 2 vols in 1 vol (Hildesheim: Olms, 1979, first publ. Erlangen: Junge, 1896-1901), II: Das British Museum mit einem Anhang über die Guildhall-Bibliothek, no. 19.